As I've mentioned before, Dawson loves wearing costumes and acting out different roles. The other morning I had his closet door open and was asking him which shirt he wanted to wear. 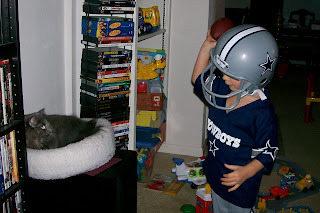 He saw his Dallas Cowboys uniform and decided he should wear that. So he spent most of the morning in his uniform. And if I addressed him as Dawson, he would tell me, "say I mean football player." His name was no longer Dawson - he was "football player."